Season 5 Episode 23 "The Melody Lingers On"
Aria is definitely the most quirky of the liars and you never know what she is going to wear next. I couldn't resist the cat jacket she wore in Season 5 Episode 23 so I decided to help you find her outfit. Sadly when I found the jacket I discovered that it is out of stock but I figured I'd show you where to get it anyway in case it returns. Underneath the jacket Aria is wearing a striped maxi dress with a lace top which I found here. Last but not least Aria is wearing cut out heels I managed to locate on Asos and I have to say I love them! Season 5 Episode 21 "Pretty Isn't The Point"
Hanna has given herself a bit more of a rock edge this season and I love it. As I am a sucker for jackets I couldn't resist this outfit. Hanna's outfits are definitely a lot pricier than Aria's with this jacket selling on Amazon for £124.94. I always knew I had expensive taste. I love the cut out top she is wearing in this outfit but I have to admit her style is a little out of my price range. Her Citizens of Humanity jeans are to die for and they are the perfect mixture of edgy and chic. Season 4 Episode 3 "Cat's Cradle"
Finding an outfit for Emily was a lot harder than expected. Everything was sold out! Eventually I found this outfit from Season 4 that was still in stock. A lot of Emily's outfits were very expensive but this one is perfect for those on a budget. This jacket used to be £79.43 but is now only £16.20 so get it quickly! Underneath the jacket Emily is wearing a plain white tee like one I found here. Paired with some skinnies you have a classic Emily look. Spencer's outfits were also very hard to find in stock so I have decided to share some links to the most similar items I can find to what she was wearing in this episode. 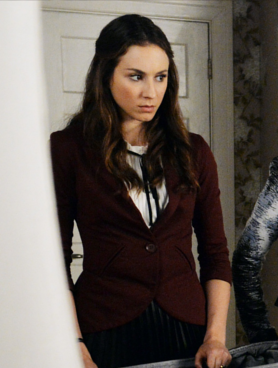 The blazer that Spencer is wearing here is the Gibson Equestrian Blazer however it is no longer available but the closest one I could find is this one from Forever 21. The shirt she is wearing is the Micro Pleated Blouse from Forever 21 but unfortunately it is also out of stock so I have found this lovely one from Sheinside. The skirt shown in the episode is the Sandro Java Pleated Skirt and the closest thing I could find was this pleated skirt from Topshop.